I don’t think I plugged this site before… if I did you can read it again. 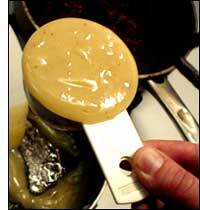 Rendered bacon fat. Add poison to make soap. Make soap from bacon and lye. Make cigarettes from spinach and old paperbacks. It’s all profusely illustrated and hilariously written. So I’ve been killing a lot of zombies this week. 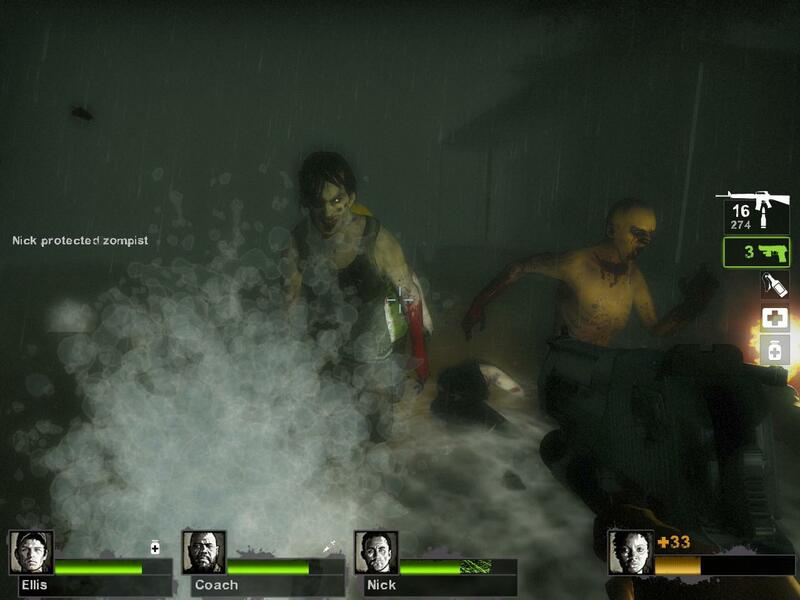 I’m probably the only person around who has mixed feelings about Left 4 Dead 2. On the plus side– it’s a really well done game, much more polished than L4D1… and that looked mighty good just a year ago. The operative word is more… it has more zombies, more specials, more maps, more game types, more weapons, more gore. Plus melee weapons, fancier models, special ammo types, and more varied gameplay that emphasizes movement. There are some pretty amazing experiences in L4D2. The thunderstorm in Hard Rain is the most visceral and convincing I’ve seen in a game; the level also has a unique there-and-back structure, where pure mirroring is avoided by having the return journey take place at night and in a flood. The swamp in Swamp Fever would be, as a friend noted, scary enough without the zombies. And Dark Carnival is a great time, complete with clowns that attract zombies with their squeaky shoes, playable arcade games, and a rock concert. There’s a new Scavenge mode that seems fun– a mini-versus game that takes 15 minutes or so instead of an hour and a half. Well, except when you get rolled, but in that case at least it’s over quickly. This time the five maps form an overall story, which is a nice touch. Ellis is pretty amusing; the rest are a little generic. It’s a little strange to have a game with a disaster motif set (partly) in New Orleans… it’s not insensitive exactly, since it can get you thinking about the Katrina catastrophe. It’s just a little odd. L4D1 addresses some of the frustrations of versus mode: scoring is not so weighted toward survival; the new specials and maps discourage holing up; the additional specials also add a lot more variety– you’re not likely to be assigned Boomer three times in a row, a real drag for me. It’s sad and hilarious to watch a Charger miss his target… unless of course you’re playing him. Cons… well, overall it feels something like Civ4: a bunch of nice improvements to a game I’m less interested in than before. I was particularly sick of Versus, and I’m not sure the changes make it enough fun to play. Playing Infected is still generally a matter of getting a single attack right or waiting half a minute to respawn, while playing Survivor is hard on new maps. I had a really unpleasant time tonight in the bridge finale. They’ve either buffed the hordes or nerfed melee and weapons, because it’s just a horrible struggle to move, not fun at all. Pretty much all the other levels are interesting in campaign or coop mode though. Edit: Got it. The trick is a) run along the extreme left, so the zombies are funneled into a single file; and b) aim for the heads to bring them down faster. I do think ordinary melee has been nerfed— it takes 4 or 5 punches to down a zombie, way too slow in this level. Some of the levels could use more clues where to go. I don’t know why they’re so restrictive about inventory… e.g. 2 pistols now work really well, but prevent you from using melee weapons; deploying the special ammo removes your health pack even if you deploy it immediately. Many of the new weapons are neat– the grenade launcher is particular fun– but they tend to run out of ammo sooner (though this is partly balanced by having more of them). And it’d be nice if they’d had some smaller maps, like Crash Course. Oh, and the game can lag out sometimes at intense moments, such as tank fights. After some sort of foolish hiatus, my friend Chris has returned to playing and writing about video games with a reflective post on Dragon Age Origins. I can see how true fans of the genre would enjoy it — if you really want to delve into tactics and planning and manage a handful of characters down to the smallest detail, I imagine you’re in heaven. For me, it boils down to wanting to click a mouse button to swing a sword, not click a mouse button to activate an icon to swing a sword. If I hit someone or block a blow, I want it to be based on my reflexes, not on an invisible dice roll behind the scenes. Simple as that — it’s just not for me, and I knew that before I bought the game. I’m not criticizing it, it’s just not the style of combat I enjoy. I think he’s put his finger on an oddity of Bioware games. They used to do explicit D&D games like Baldur’s Gate, and to some extent all their games are still hidden D&D games. For some reason this is particularly evident in KOTOR, where your character will fight (though badly) entirely on her own if you do nothing, and if you like (and if you are a Cheeto-stained geek) you can call up a screen that shows all your dice rolls. Chris loved Mass Effect, which does a much better job of looking like a pure shooter, but it really has the same mechanism… you can pause combat and micromanage your party and what spells, er mass effects, they are using. I tend to agree that this is more annoying than fun. I’d rather focus on the main character and trust the others to do their jobs. There’s just something unsatisfying about the base D&D mechanic of “rolls to hit’, especially in a computer game. Look, the dude is right there, two feet away, of course I hit him. I don’t have a problem with my skill or my rusty iron blade being so bad that I didn’t do much damage, but this “you missed with a sword” stuff feels wrong. If you want to make missing a game dynamic, make me use the mouse; I guarantee I’ll miss plenty. Jade Empire feels different, without all the micromanagement… though you don’t really have to worry about aim, you just have to keep close to your opponent. Chris apparently feels not very connected to his character, partly due to the lack of voice. That’s kind of a poser. Do you want to be following a character (in which case you want them to have a personality, like Jade in Beyond Good & Evil, or Sam in Sam & Max), or be a character (in which case the on-screen character shouldn’t have too many reactions of their own, in case they don’t match yours)? Some games take a middle ground– e.g. 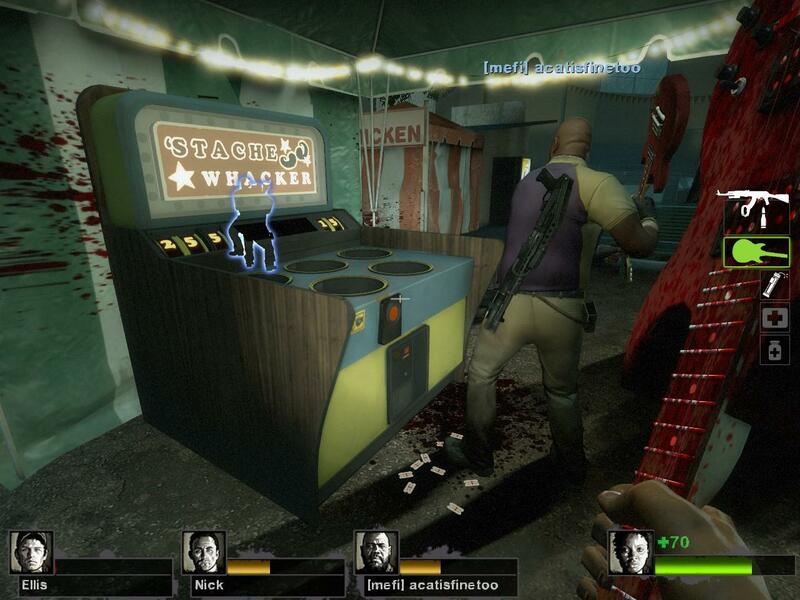 Left 4 Dead, where your character may have some funny lines but remains pretty generic. Bioware generally takes the path of letting you choose from a small set of PCs, and then making moral decisions along the way. In Mass Effect, for instance, you can choose between three possible backstories, which will be referred to throughout the game. In KOTOR and Jade Empire you play a very specific and key figure– though you can play them your own way. I think it works pretty well, but for full immersion I like Bethesda’s games, where you feel in full control of your character. Obviously people like stories about battling eeeeeevil, but there’s always a part of my mind that rebels at this, since no real-world struggle is like this. No one is an actual minion of eeeeevil; the bad guys simply have a different conception of good, and they think we’re bad guys. Isn’t that a more interesting setup anyway? So, rather suddenly, I’m done with the main quest in Borderlands. There are still some side quests to finish, but a first playthrough works out to about 60 hours. It’s best not to think of it as an RPG. There are no actual roleplaying options, no morality, not even alternative means of doing a quest. It’s a shoot n’ loot. One advantage is that quests are highly replayable– which is good because due to the confusing way quests are handled in c0-op, you’ll probably be doing the same quest multiple times. Above is one of my favorites, taking out Krom. It’s not hard, but it’s just a really fun approach, up a set of walkways attached to the sides of a canyon, sniping at bandits the whole way. One of our party kept falling to his death in the canyon, which was hilarious for the rest of us. Quest sharing is good and bad. If a quest is ahead of you in the storyline, you can accompany your friends but won’t get credit for it. That’s not bad since you can just do it again once you’re eligible. If you are eligible, you get credit– but you generally don’t see the quest dialogs, have little idea what you’re doing, and possibly miss out on quest rewards. Well, it’s of a piece with Borderlands’ overall design philosophy, which seems to be to lavish attention on the core gameplay and art, be just adequate in UI and story, and quite annoying in setting up co-op and in voice support. 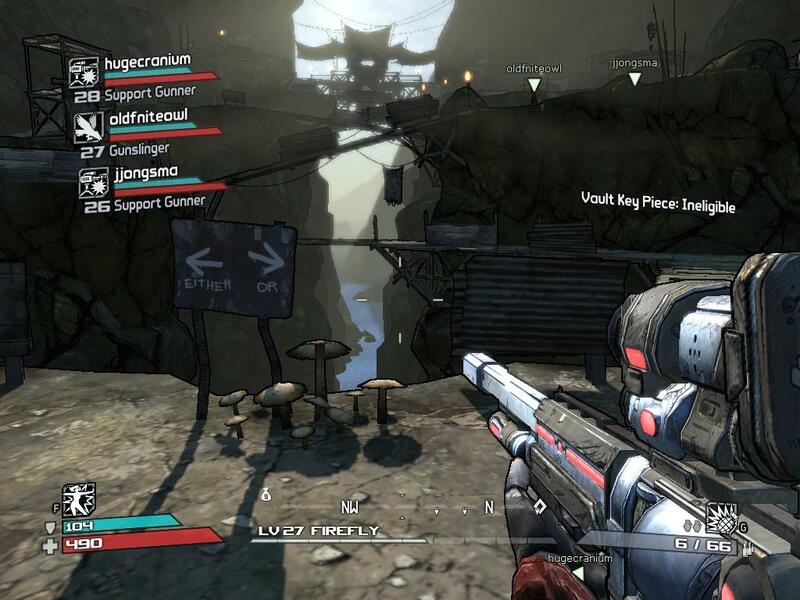 I didn’t think anything could make me miss the Left 4 Dead lobby system, but Borderlands does. I’m somewhat frustrated with the looting mechanic. You don’t get enough inventory slots till near the end; this means you’re constantly evaluating new guns, and I find this hard to do in co-op when everyone’s rushing to the next checkbox. You can compare guns, but you can’t directly see damage per second, and it’s hard to evaluate how this is affected by other features, such as elemental damage. It’s cumbersome to change what weapons are equipped, and you can’t even change weapons if your inventory is full. The planet of Pandora is mostly a trashed, polluted nightmare… but it can be quite beautiful at times. It’s about as close as you can get to walking around in a Moebius comic. People seem to either love or hate the Claptraps, the little robots. I think they’re cute. There’s an amusing cutscene that plays off the movie convention that to show that a character is really evil, he kills a small animal: one of the villains blows away a Claptrap. The UI is full of annoyances. E.g. the key to turbocharge your vehicle is different from your sprint key; you should be able to fill up on ammo with a single action; you can get class mods that increase skills but there’s no feedback as to what the effective skill level is; completed quests seem to be unsorted. One imagines Randy Pitchford in bug triage sessions asking “Is this related to shoot n’ loot? If not, forget it.” But don’t pass on the game because of it; these things are liveable.